The ancient county town of Pingyao, 90 kilomerers southwest of the city of Taiyuan, is a famous historical and cultural town in China. It is also known as the Turtle Town because turtle symbolizes good luck, longevity and rock-like steadfastness. Pingyao is one of the few ancient towns with a relatively long history and in better preservation. It is a major historical monument under provincial protection. 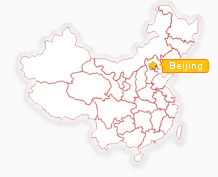 The ancient city was first built during the reign of King Xuan between 827 and 782 B.C. in the Zhou Dynasty. The Town wall of bricks and stones we see today was built in 1307, the third year of the Hongwu reign of the Ming Dynasty, when the town wall was reconstructed and enlarged for defense on the foundations of the Western Zhou Dynasty. This county town wall was repaired 26 times during the Ming and Qing periods. The ancient square town wall of Pingyao is 6157.7 meters in circumference and 6-10 meters high, which were built in the Ming Dynasty (1368-1644). There are towers on the six gates, 3,000 crenels and 72 castles on the walls surrounded by moats, all typical of ancient Chinese architecture. 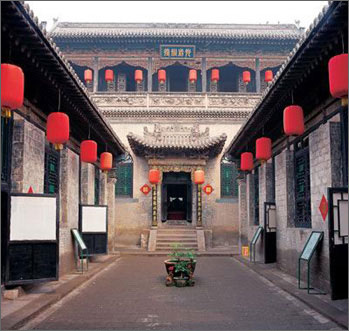 Inside the city, the streets, residential quarters with courtyards and shops all preserve their ancient Ming and Qing styles. Inside the town, there are a large number of residential buildings and temples built at the end of the Qing Dynasty. 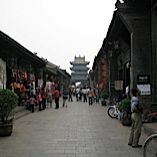 The ancient town of Pingyao is made up by these old building together with the ancient town wall. First established in the reign of King Xuan (827 ? 782 B.C.) of the Western Zhou Dynasty, Pingyao has a history of more than 2700 years. It is a typical town of North China at county level based on the architectural concept and tow planning of ancient Han people. The present city walls were constructed in the 3rd year of the first Emperor Zhu Yuanzhang of Ming Dynasty (1368-1644). Covering an area of 2.25 square kilometers, the old town has a population of about 45,000. The city wall stretches for about 6 kilometers. The town is protected by a city moat, both three meters in depth and width. Outside the city gate is a drawbridge. The north and south sides have one gate each. The east and west sides have two gates each. This pattern is similar to that of a turtle (the head, tail, and four legs), hence, its nickname Turtle City. Aside from the four structured towers at the four corners, there are also 72 watchtowers and more than 3,000 battlements. Within the city, four big streets and eight small streets radiate to join with 72 lanes. The 3,797 original quadrangle residential houses are all of the same black-colored bricks and gray-colored tiles. Out of the total, over 400 of these courtyard houses are still well preserved. There are also temples of varying size and old-fashioned stores. In 2004, a small part of the southern walls collapsed, but have been built. However, the rest of the city walls are still intact and are considered among the most well-preserved ancient city walls of this scale. Richangshen Exchange Shop (Piaohao) was established in 1823 of Qing Dynasty (1644-1911), it is the first private financial organization of China m ajoring in deposit schemes, loans and remittance services. The headquarter was situated at Pingyao old town with an area of 1,600 square meters; its 35 plus branches are widely spread all over China mainly in those big commercial cities. 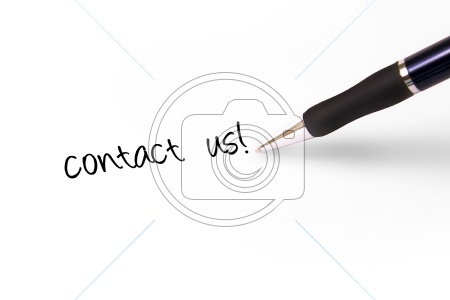 The business lasts 108 years, playing an important role in the development of civil economy and industries. Situated at Jingsheng Town of Lingshi County, some 150 kilometers (93.2 miles) south of Taiyuan (35 km to Pingyao), Wang Family Compound is a masterpiece of Oriental domestic architecture. The compound had been built successively during the periods of Kangxi, Yongzheng, Qianlong and Jiaqing Emperors of Qing Dyansty (1644-1911). It covers a total area of 250, 000 square meters. The architectural complex at Gaojiaya nicknamed China Civil Dwelling House Art Museum, officially open to the public on August 18, 1997, was constructed during 1796-1811. It consists of 35 courtyards, 342 houses, totaling 19572 square meters. The architectural complex at Hongmenbao called Museum of the Wang Family open to the public one year later, was built during 1762-1793. It consists of 88 courtyards, 776 houses, totaling 25,000 square meters. The compound can be divided into three distinct groups known as the Gaojiaya, the Hongmenbao and the Ancestral Temples. The two groups of buildings at Gaojiaya and Hongmenboa stand from east to west facing each other, which are linked with a bridge. They are all fortress-like constructions on the loess plateau, and were built on the terraces of the mountainside. 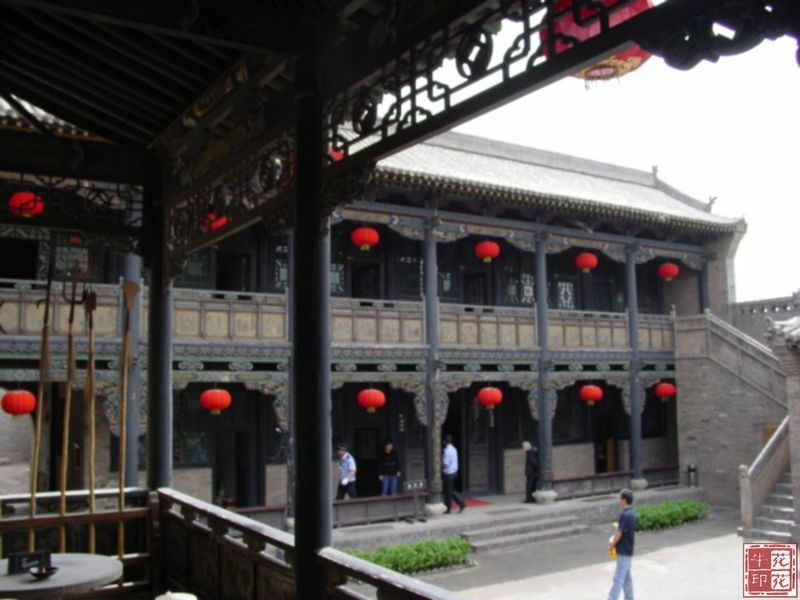 The Gaojiaya (East Courtyards) has a series of dwelling houses that are walled off in the form of an irregular castle, while they each retain the traditional layout of the hall in front with the bedchamber to the rear. Gates stand at each of the four cardinal points, providing access to the various courtyards. The buildings are spread in tiers up the mountainside and are aligned in six parallel complexes. In the centre there are the three main courtyards, which vary in size. The complex to the east is the kitchen, while those on the west served as the private family school and the garden. A secret passage leads into the gardens flower cellar, which provided access in an emergency. At the north of the complex there is a row of thirteen cave dwellings. These command the highest position overlooking the entire area and served also as a watchtower. The arrangement of courtyard within a courtyard, door after door and house above house creates a labyrinthine world. A stone bridge over a moat will take you from the Gaojiaya to the Hongmenbao (West Courtyards), which measures 105 meters (344 feet) in width from east to west and 180 meters (591 feet) long from south to north. This complex has only one gate, the door of which was painted red, hence, its name ? 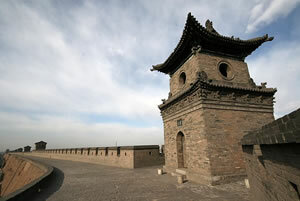 Hongmenbao (meaning Red Gate Castle). The curtain wall is 8 meters (26 feet) high on its outer side but only 4 meters (13 feet) high from within. Constructed from grey bricks and some 2 meters (6.7 feet) thick, the wall has a battlement top. Within the main courtyards there are cave dwellings over which a second storey has been built. Movement within the castle is facilitated by a street that runs lengthways and which is intersected by three running crosswise. The pattern they form is the same as the Chinese character Wang, the family name. The Qiao Family Courtyard is another masterpiece of traditional civil architecture in North China. It lies at Qiaojiapu Village, 54 km south of Taiyuan. It was the residential house of the well-know financier Qiao Zhiyong of Qing Dynasty, also called Zai Zhong Tang. First built in the period of Qianlong Emperor of Qing Dynasty, renovated and expanded later, this compound has been turned into a magnificent complex with the unique character of traditional architecture. Qiao Family Compound encompasses 8,724.8 square meters of land, consisting of 6 large yards and 20 small yards with 313 houses in total. It was repaired and rebuilt many times during the reigns of emperors Tongzhi and Guangxu in the Qing Dynasty and the beginning years of the Republic of China (1911-1949). It was an old Chinese residential courtyard that thrived for over two centuries. When you look down at the overall yard above ground, it looks just like喜喜 (double happiness in Chinese). Entering into the gate of the courtyard, first, you can see an 80-meter-long straight stone pavement that divides 6 courtyards into a northern and southern row. There are slope protections between the pavements and nearby walls. The Qiao familys ancestral temple is at the end of the western side, which directly faces the gate. There are 4 main buildings and 6 other structures, such as a gate pavilion and the Geng and Tiao pavilions. The sidewalks on the roof of every yard are connected to allow for patrol. Viewed from outside, the residency is serious and grand, with long yards; viewed from inside, it is splendid and orderly, reflecting the residential style of big families in feudal society in North China. The courtyards three sides face the street, while the courtyard itself is completely surrounded by a 10-meter-high sealed water-milled brick wall. Yards and houses are linked with other yards and houses while the sidewalks above row upon row of roofs - such as the Xuanshan, Xieshan, Yingshan, Juanpeng, and Horizon roofs -- link up the battlements. Yards contain smaller yards as well as gardens. The doors, windows, eaves, stone stairs, quadrangular railings, and the Chuanxin, Pianxin, and Jiaodao yard are all beautifully shaped. You can see brick carvings everywhere in the yards: backbone carving, wall carving, and railing carving, all of which are based on figures, allusions, flowers and plants, birds, beast, chess, and painting and calligraphy. The carving designs are so exquisite and their workmanship, so fine, fully showing the special style of residential building in the Qing Dynasty. In 1990, this ancient mansion became more famous all over China and abroad thanks to the movie Raise the Red Lantern by the director Zhang Yimou. After the filming was finished, the drama production team left behind several hundred red lanterns. Since then, these lanterns have been the most important decoration both in the Qiao Family Grand Courtyard and other jin shang courtyards. 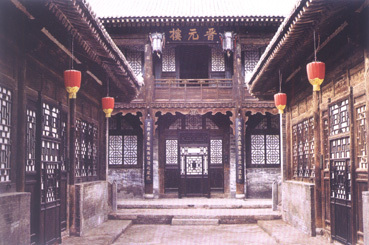 In 1986, the Qi County government rebuilt the courtyard into the Qi County Folk Museum that features art, science, and other things of interest. It contains 42 exhibition rooms displaying a wide range of material covering subject areas such as years, time, season, food, clothing, shelter and transportation, wedding and funeral ceremonies, and agriculture trade activities. In total, approximately 2,000 pieces of exhibits reflect the folktale custom in the Shanxi Jinzhong area. Located at the heart of Shanxi, wheaten food is the staple food of the local people. Different types of wheat flour food are available here like Soy-sauce noodle, noodle with soybean paste. Besides, trying a bowl of millet gruel might be a good choice after the oily meals in big cities. 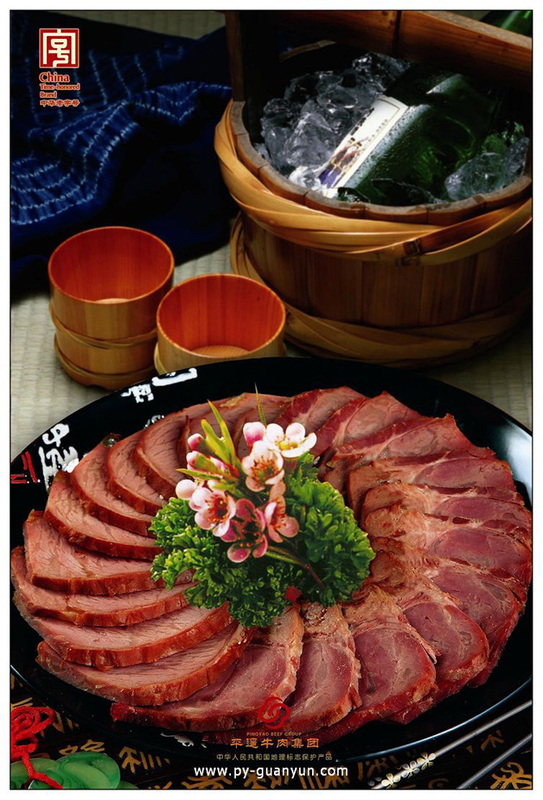 Once was highly praised by Dowager Cix of Qing Dynasty, Pingyao beef is the most famous specialty of this region. Started from Han Dynasty (206 BC-220AD), it has been very well known in Ming Dynasty (1368-1644). The Jiaqing Emperor of Qing Dynasty (1644-1911) granted it the title Ultimate Beef. Since then, the Pingyao beef has come to its heyday. After the founding the New China, Pingyao beef also got several national awards. Pingyaos Tuiguang Lacquerware is famous for its fine hand polished finish. The process used in its production dates from the early years of the Tang Dynasty (618-907) and it prospered in Ming (1368-1644) and Qing (1644-1911). With a simple antique appearance, such lacquerware looks most elegant, with a wonderful smooth, shining surface. The principal color of the lacquerware is coal-black, but Chinese red, an apricot color or greenish purple are also used. Most are then decorated with golden and resplendent designs based on figures from classical novels or legends. Whats more, the designs are achieved with inlays of small polished shells, mother of pearl, ivory and even colorful pebbles, which add much to their delicate appeal. There is a wide variety of lacquerware available ranging from folding screens, wardrobes or jewelry caskets.